When RIM (Research in Motion) announced the Playbook, in September 2010, they were greeted with lots of love from the market and people everywhere. Eight and a half short months later, however, when the Playbook hit store shelves for the first time, the reception was less than stellar. In this blog, we take a look at the launch of the fabled Playbook and how a few miscues caused RIM to be labeled the next Palm. Back in early 2010, the executives at RIM knew that they had to make a move, do something to keep the proverbial wolves, Apple and Android, at bay and preserve their share in the rapidly growing mobile market. They put together a team to research how they could build something with the portability of a smart phone and the power of a computer; basically, an extension to the Blackberry. That April, Apple launched the iPad, and their idea was validated – the race was on to build their own tablet. To achieve this, they needed to make an acquisition, as the Blackberry OS (operating system) was aging and nowhere near as snappy as the current iOS (Apple) and Android OS. That April, they announced the acquisition of QNX and the push to build the Playbook began. After a frustrating summer and a languishing stock price, Mike Lazaridis, Co-CEO of Blackberry, took the stage at Blackberry DEVCON in September and announced the launch of the Playbook for Q1 2011 – everybody was pumped. With some newfound momentum and a buzz around the company not seen since its early days, the boys at Blackberry had to move fast. To bring a device to market at the caliber of a tablet to market in under a year was no small task. RIM moved quickly and started to make efforts to rally the developer community to build an app ecosystem – the offer, a free Playbook for any developer who created an approved application by launch date. For months, the technology industry was abuzz about both the Playbook and RIM’s future. Their stock price increased more than 40% from its low and many were waiting with great anticipation for the launch of the Playbook. Jim Balsillie, RIM’s other Co-CEO called it the Company’s most important product launch since the original Blackberry. 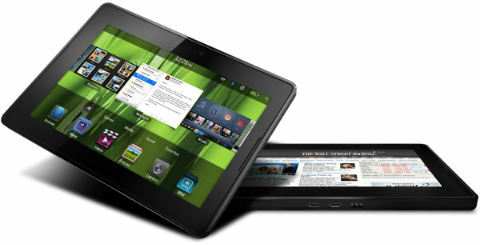 The Playbook launch day was announced in early March for April 19. In RIM’s earnings call in late March, Jim Balsillie boldly stated “it’s a winner, it’s such a winner.” Needless to say the bar was set high. As the launch date grew increasingly closer, speculation, and confusion grew; what features would the Playbook have? How many apps would there be? Could it be used as a standalone device? These questions, and many more were being aired on blogs, Twitter, forums and everything in between. For three weeks prior to launch, I collected tweets, blogs, articles, marketing material and everything else relevant to the Playbook. I created a visual (pictured below), which I call the Sentiment Graph, for the launch to show the pulse of the Playbook up until launch date. This document is saved as a large PDF, so if you are interested in seeing the file, email me at joel @ lumosforbusiness.com and I will send it your way. Then on April 14, professional reviews started to come in; the consensus – the product was half-baked, or unfinished. Features were missing, there was a lack of apps, and it certainly wasn’t anything comparable to the iPad. When launch day finally arrived, reality set in and even though people were buying them, the product was far below what it was built up to be. So what caused the launch of the Playbook to be such a let down? The Playbook was billed by RIM to be an iPad killer. If you are going to come out and bill your product as something greater than one of the most successfully launched products in history, you better have something special, really special. Simply put, if you don’t have an unbelievable product ready to go, then don’t label it as one. Because when people go to buy a Playbook or read reviews and see that it doesn’t even have native email, are they really going to believe it’s an iPad killer? No; therefore, it’s better just to talk about the product in ways that will give people a clear idea of what to expect – no buzz, jargon, or giant-slaying statements. If it really is amazing, just do a good job of getting the story out there and let customers do the rest of the work. Right from the get go, the communication about the Playbook was less than stellar. Marketing material included statements like “Built for business,” “Rich application ecosystem,” and “Professional grade performance.” Yet a great majority of people who were excited about the product were consumers, there was talk about the dearth of apps right from day one and what does professional grade performance really mean? Then there was the confusion related to features like Blackberry Bridge, Android apps and email. Social media and the blogosphere were filled with people trying to decrypt RIM’s statements and figure out just what the Playbook would look like at launch. In the end, many people seemed so confused that they felt like they would just have to wait and see it for themselves, which certainly killed a lot of the buzz. In addition to the lack of cohesiveness for its marketing and communication, many steps in the launch process seemed to the lack the finesse that you would expect to see from a company of this caliber. Developers, for one, seemed to be at odds with RIM right from the beginning with the whole development process. More obviously, however, were the stores selling the Playbook. RIM was thrilled about the fact that they had over 20,000 stores selling the tablet, but if you actually went into a store, ie. Staples, Best Buy, etc., the experience was terrible. Sales reps didn’t know what they were talking about, demo units either didn’t work or weren’t available, and the whole energy needed to make a product like this really successful was missing. To be successful in the mobile market in this day and age you need to build an ecosystem, and you can’t do that without a strong community of developers. To build the killer apps that can turn your platform into a bestseller, developers need tools, support and easy application procedures – and it needs to be at least somewhat straightforward. If you followed any of the action on the Web, you would have seen that the majority of developers were less than happy with the development process. This letter by Jamie Murai sums at least some of the pent up exacerbation at RIM. Overall, RIM seemed to miss an opportunity to bring more developers on board simply because the app development process was so opaque and troublesome. For all the work they did on the QNX OS, the hardware design and everything else, how RIM could miss a few simple features that customers really want, ie. native email, is hard to fathom. Despite months of speculation and chatter about the native email, calendar and contacts, numerous reviews about how problematic this was (Om Malik wrote a great review, but specifically stated he would not buy it because of the lack of native email), and yet Jim Balsillie states in an interview with the Wall Street Journal that he believes most people won’t need it because they can use the browser. Incredible! Despite all of the above-mentioned errors, RIM did a lot of things really well and the Playbook shows a lot of promise. The QNX OS looks fantastic, the hardware is solid, and the company made a great effort to deal with the app situation by adding the Android emulator and creating a native Playbook SDK (to be launched in the summer from what I have heard) with some snazzy features. Jim Balsillie also announced that the native email, calendar and contacts would be available by the summer, and the Playbook seems to have a great over-the-air (OTA) update system to make this process seamless for users who have already bought the product. By the end of this year, the Playbook should be looking a lot better than it did at launch date. The silver lining behind all of this for RIM is that they can take all of these lessons learned from the mistakes made during the Playbook launch and use them to make the launch of the new QNX super phones (slated for Q1 2012 last I heard) a smash hit. With the integration of the browser from Torch Mobile, the UI from The Astonishing Tribe (TAT) and the revamped OS, RIM can really make a splash where it matters most right now, the smart phone market. Despite the hit to their stock price, brand and general morale, RIM still has an opportunity (in my opinion) to get back into the game if they can execute on the launch of these phones. Regardless of what happens in the future, the launch of the Playbook provides a great case study for what not do when launching a new product into the market. Lets hope that lots of startups and companies of the future can learn from product launches like this one and create a game plan without ripping a page from RIM’s playbook. We created a strategy case study about the launch of the Playbook in Canada. To learn more, head over to the blog post ‘Strategy Case Study: RIM Launches the Playbook’ or contact me directly at joel at lumosforbusiness dot com for a copy.